Many people associate the term “low-fat” with health or healthy foods. Some nutritious foods, such as fruits and vegetables, are naturally low in fat. However, processed low-fat foods often contain a lot of sugar and other unhealthy ingredients. Here are 10 low-fat foods that are bad for you. In some ways, breakfast cereal appears to be a healthy way to start your day. However, most cereals are loaded with sugar. In the ingredients section, sugar is usually the second or third item listed, meaning it’s present in large amounts. In fact, a 2014 report by the Environmental Working Group found that the average cold breakfast cereal contains nearly 25% sugar by weight. What’s more, it’s not just white table sugar that you should worry about. White sugar, brown sugar, high-fructose corn syrup and honey all contain fructose. Excess amounts of fructose have been linked to an increased risk of obesity, heart disease, kidney disease, type 2 diabetes and other health problems (1). Additionally, the “healthiest” low-fat cereals may be some of the worst offenders. For example, half a cup (49 grams) of low-fat granola contains 14 grams of sugar. This means 29% of the total calories are sugar (2). Bottom Line: Low-fat, sweetened breakfast cereals are high in sugar, including “healthy” varieties such as granola. Coffee is one of the healthiest beverages you can drink. It contains antioxidants that protect heart health and is associated with a decreased risk of type 2 diabetes (3, 4). Coffee also contains caffeine, which can improve mental and physical performance while increasing metabolic rate (5, 6). On the other hand, the high sugar content of flavored low-fat coffee drinks can negatively affect health. For example, a 16-oz (450-gram) nonfat mocha drink has only 2 grams of fat but a whopping 33 grams of sugar. That’s 57% of total calories (7). Not only does this beverage provide a hefty serving of fructose, but it’s in liquid form, which seems to be especially harmful to health (8). Liquid calories aren’t as satisfying as calories from solid food. They promote a higher daily calorie intake that may lead to weight gain (9, 10). Bottom Line: Adding sugar to coffee transforms a healthy beverage into one that may lead to weight gain and disease. Yogurt has a long-standing reputation as a healthy food. Studies show that plain yogurt may help with weight loss and improve body composition, in part by increasing levels of the fullness hormones GLP-1 and PYY (11). However, low-fat, sugar-sweetened yogurt contains too much sugar to qualify as a nutritious choice. In fact, many types of low-fat and nonfat yogurt are as high in sugar as desserts. For example, 8 ounces (240 grams) of fruit-flavored, nonfat yogurt contains 47 grams of sugar, which is nearly 12 teaspoons. In comparison, an equivalent serving of chocolate pudding has 38 grams of sugar (12, 13). Nonfat and low-fat yogurts also contain minimal conjugated linoleic acid (CLA), a compound found in dairy fat that may cause fat loss (14, 15). Bottom Line: Plain yogurt made from whole milk is healthy, but sweetened low-fat yogurt can be as high in sugar as desserts. Salad dressing enhances the flavor of raw vegetables and may improve a salad’s nutritional value. Traditional salad dressings are high in fat, which helps your body absorb the fat-soluble vitamins A, D, E and K.
In addition, fat helps you absorb antioxidants from foods such as leafy greens, carrots and tomatoes (16, 17). In contrast, low-fat and fat-free salad dressings don’t contribute any health benefits to your meal. Most of them also contain sugar and preservatives. While it’s no surprise that sweet dressings such as honey mustard and Thousand Island are high in sugar, many others are also loaded with sugar or high-fructose corn syrup. This includes fat-free Italian dressing. The healthiest salad dressings are made without sugar and contain natural fats such as olive oil, which provides benefits for heart health (18, 19, 20). Bottom Line: Low-fat and fat-free salad dressings contain sugar and additives but lack the benefits of healthy fats like olive oil. Peanut butter is a delicious and popular food. Studies suggest that peanuts and peanut butter may have benefits for appetite control, body weight, blood sugar and heart health (21, 22, 23, 24). It’s high in monounsaturated fat, including oleic acid, which may be responsible for many of the benefits. However, note that natural peanut butter contains only peanuts and perhaps salt. By contrast, reduced-fat peanut butter contains sugar and high-fructose corn syrup. What’s more, although the total fat has been reduced from 16 grams to 12, some of the healthy monounsaturated fat has been replaced by processed vegetable oil. The calorie content of natural peanut butter and reduced-fat peanut butter is the same: 190 calories in 2 tablespoons. However, natural peanut butter is far healthier. Bottom Line: Reduced-fat peanut butter contains sugars and processed oils yet provides the same number of calories as natural peanut butter, which is much healthier. A small, 71-gram, low-fat blueberry muffin contains 19 grams of sugar. This is 42% of the calorie content (25). One group of researchers reported that the average commercial muffin is more than 300% larger than the USDA standard size (26). With the exception of bran muffins, low-fat muffins contain little fiber and often have a high glycemic index (GI). High-GI foods raise blood sugar quickly, which may increase the hunger that drives overeating and leads to weight gain (27). 100 grams (3.5 oz) of nonfat frozen yogurt contains 24 grams of sugar, while that amount of ice cream contains 21 grams (28, 29). Bottom Line: Frozen yogurt contains as much or more sugar than ice cream, and it’s typically consumed in larger quantities. 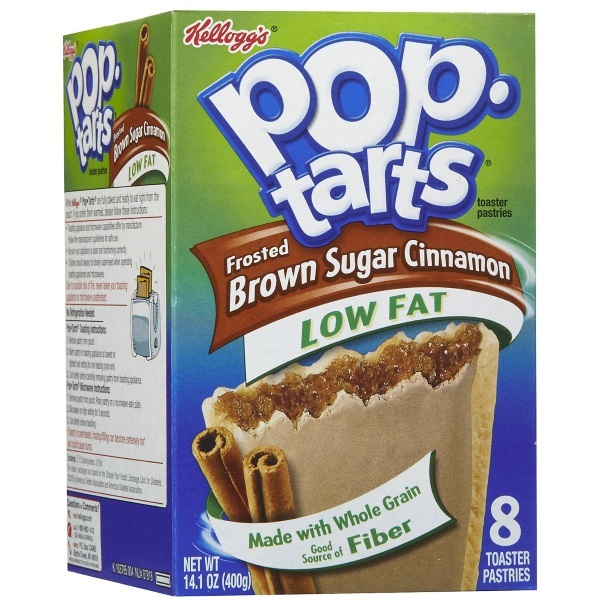 However, researchers found that these low-fat versions were not very satisfying compared to the originals (30). Like most low-fat foods, the sugar content of these cookies is high. A fat-free oatmeal raisin cookie has 15 grams of sugar, which is 55% of its total calorie content (31). In fact, research shows that consuming high-protein snacks can help prevent overeating (32). One popular low-fat, strawberry-flavored cereal bar contains 13 grams of sugar but only 1 gram of fiber and 2 grams of protein (33). What’s more, some of the light spreads specifically marketed as being “heart-healthy” actually contain small amounts of trans fats, which have been linked to inflammation, heart disease and obesity (34, 35, 36).